The trenched section of Interstate 95 through Chester. Photo taken 01/19/17. Interstate 95 angles northeast from Claymont, Delaware to the Pennsylvania Turnpike at Bristol through Philadelphia and southeastern Pennsylvania. A heavily traveled route, the 51.2-mile stretch in the Keystone State is mostly urban, paralleling railroad lines and streets lined with row homes both in Chester and Northeast Philadelphia. The freeway also spans the Schuylkill River on a double decked through truss bridge. Sign changes started in January 2018 renumbered Interstate 95 leading north from the Pennsylvania Turnpike (I-276) at Bristol to U.S. 1 near Lawrenceville, New Jersey as an extension of Interstate 295. 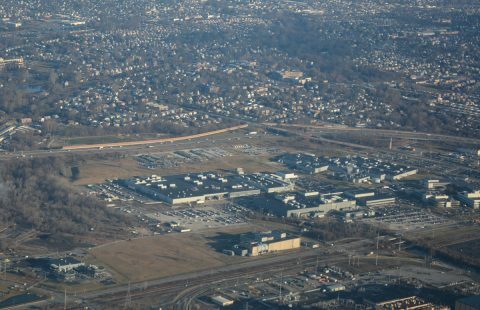 This coincided with the relocation of I-95 from near Morrisville and the Trenton belt line onto both the eastern extension of the PA Turnpike, and the Pearl Harbor Memorial Extension of the New Jersey Turnpike. Work on two new flyovers joining I-95 with the Turnpike in Bucks County ran through September 2018. With completion of those ramps on September 23, 2018, I-95 provides a seamless link between Philadelphia and the New Jersey Turnpike leading north toward Newark and New York, eliminating the long standing gap for the Interstate between Trenton and Brunswick. 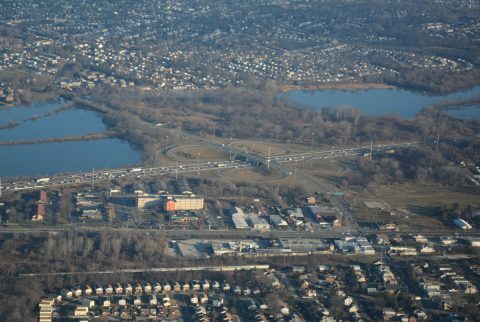 Interstate 95 at Stewart Avenue (Exit 8) in Ridley Park. Photo taken 01/19/17. Interstate 95 at Pennsylvania 420 (Exit 9) at Tinicum township. Photo taken 01/19/17. 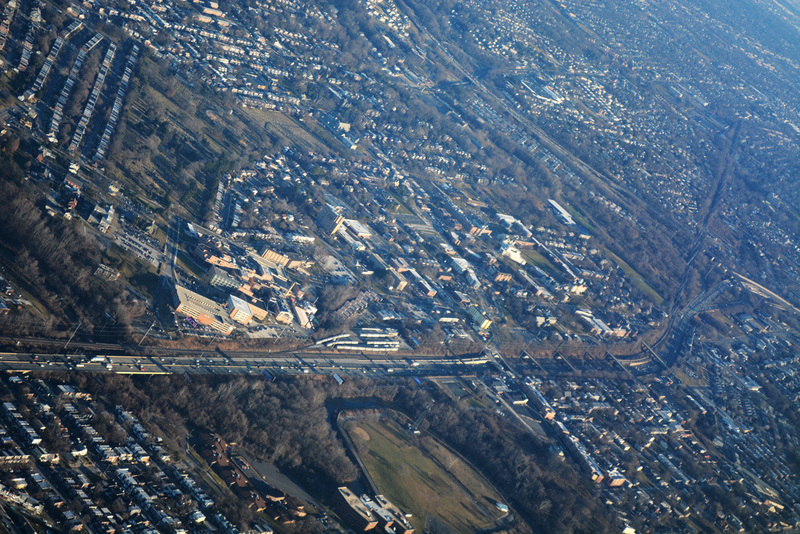 I-95 Section GIR (I-95/GIR) - reconstruct and widen three miles of I-95 between I-676 and Allegheny Avenue. I-95/GR1 project - $91.3 million, work underway from November 2011 to 2017 reconstructed and widened a number of streets and two railroad bridges. I-95/GR2 project - $39.3 million, construction ran from October 2012 to 2016. Bridge replacement and reconstruction and expansion of I-95 from south of Shackamxon Street to north of Columbia Avenue to eight general travel lanes with an auxiliary lane in each direction. I-95/GR3 project - $211.7 million, started in 2014, work extends into 2018. Widening and rebuilding of I-95 northbound to four lanes with an auxiliary lane, from Columbia Avenue to north of Ann Street. 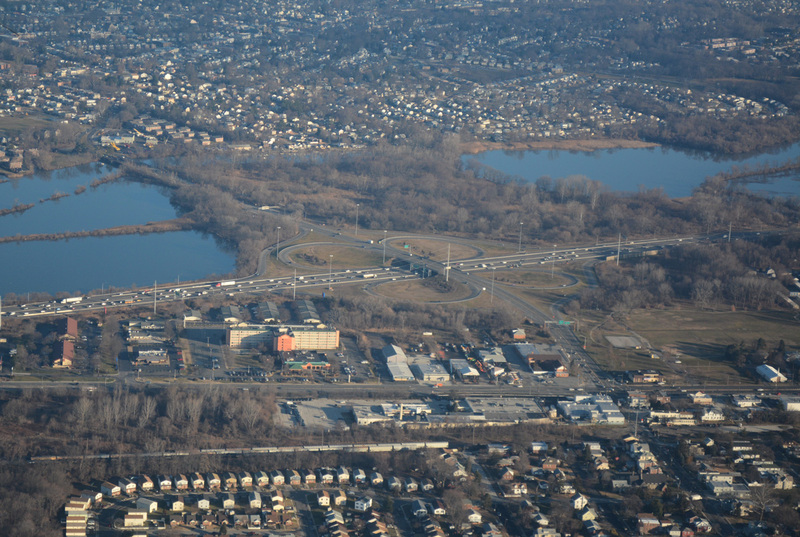 Relocation of on and off-ramps at Girard Avenue. I-95/GR4 project - Work slated for 2018 to 2023 will widen and rebuild I-95 southbound from Columbia Avenue to north of Ann Street to accommodate four general travel lanes with an auxiliary lane from Girard to Allegheny Avenues. I-95/GR5 and GR6 - projected for 2024 to 2028 and 2015 to 2021 respectively. Outlined construction includes widening and reconstructing the I-676 (Vine Street Expressway) ramps with I-95 north and southbound and bridge replacement or rehabilitation for Interstate 95 from Spring Garden Street to Frankford Avenue. I-95 Section AFC (I-95/AFC) - work starts in early 2018 on rebuilding and expanding 1.5 miles of I-95 from south of the Betsy Ross Bridge interchange to Ann Street. Construction includes reconstruction of the freeway mainlines, 11 bridges for north and southbound, and interchanges with Allegheny Avenue and Castor Avenue. This includes a new connection from the Caster Avenue on-ramp to the Betsy Ross bridge. I-95 Section BRI (I-95/BRI) - expand and rebuild a 0.8 mile section of I-95 leading to and from the Betsy Ross Bridge Interchange. I-95/BR0 project - $160.3 million, work started in March 2015 and finished in Fall 2017. The project widened ramps from I-95 north to Aramingo Avenue and from Aramingo Avenue south to I-95. The southbound flyover from I-95 to the Betsy Ross Bridge was relocated and new ramps were linking the Betsy Ross Bridge with Aramingo Avenue. I-95/BS4 project - $81 million, started in January 2017, scheduled completion is 2020. Completes reconstruction of the interchange ramps west of Aramingo Avenue and finishes work on the new ramps between the Betsy Ross Bridge and Aramingo Avenue. Work also advances on the first section of the Adams Avenue Connector, between Aramingo Avenue and Torresdale Avenue. I-95/BR2 project - anticipated to start in late 2018, the phase includes replacement of the flyovers linking I-95 north with the Betsy Ross Bridge and from the bridge to I-95 south. I-95/BR3 project - forecast to start in 2023, rebuilds the northbound lanes of Interstate 95 from Wheatsheaf Lane to just north of Margeret Street. This includes removing the low level structure for the northbound lanes and c/d roadway beyond Frankford Creek and replacing it with engineered fill. I-95/BR4 project - design work begins in 2021, with construction anticipated for 2026. This project rebuilds the southbound roadway and widens it from three to four lanes. Work also replaces the low-level structure for both the mainline and c/d roadway, from Orthodox Street south to the Betsy Ross Interchange with engineered fill. I-95/BR5 project - construction slated to begin in 2020. The phase rehabilitates the Conrail/NJ Transit (DelAir Branch) bridge across Interstate 95 and removes the railroad bridge over the abandoned section of Thompson Street. I-95 Section BSR (I-95/BSR) - expansion and rebuilding of 1.7 miles of I-95 between Margaret and Levick Streets. I-95/BS1 project - stating in late 2018, work widens the freeway to eight overall lanes at the north end of the Bridge Street Interchange and replaces bridges over Van Kirk and Comley Streets. Associated work shifts the James Street southbound off-ramp further north to connect with a new underpass linking Carver Street with Tacony Street. The project also adds a new northbound on-ramp from Tacony Street and the Delaware Avenue extension. I-95/BS2 project - anticipated for early 2021, the phase rebuilds both roadways for I-95 from just north of Margaret Street to just north of Carver Street, to four lanes in each direction. The viaduct over Tacony and Bridge Streets will be replaced and the northbound on-ramp from Bridge Street reconstructed. I-95/BS4 project - $81 million, work underway from January 2017 to 2020. Finish work on the new ramps linking the Betsy Ross Bridge with Aramingo Avenue, and construct the eastern half of the Adams Avenue Connector. I-95 Section CPR (I-95/CPR) - reconstruct and widen 1.4 miles of I-95 between PA 73 (Cottman Avenue) and Bridge Street. I-95/CP1 project - $34 million, work started in April 2009 and was completed in September 2012. It included a new southbound on-ramp from State Road to replace one from Princeton Avenue. I-95/CP2 project - $212.3 million, work started in November 2012 and ran through late 2017. Seven bridges along I-95 were reconstructed and widened to four lanes between Bleigh Avenue and Levick Street. A new southbound on-ramp was built from Cottman Avenue. The Scudders Falls Bridge Replacement Project upgrades a 4.4 mile section of I-295 (former I-95), from PA 332 (Yarley-Newtown Road) to CR 579 (Bear Tavern Road) in New Jersey. A new tolled six lane span replaces the 1959-completed four-lane bridge carrying I-295 across the Delaware River between Lower Makefield Township and Ewing Township, New Jersey. Work includes reconstructing the interchange with New Jersey 29 at Ewing and reconfiguring the Taylorville Road Interchange in Lower Makefield. Construction runs for 4.5 years, with the first of the two new bridges opening in 2019. Tolls will be implemented at that time for the southbound direction. Three different shield assemblies were posted along the northbound on-ramp at the Pennsylvania Welcome Center near Marcus Hook over a ten year period. Photo taken 08/04/04. Second photo taken 07/27/07. Third photo taken 10/05/14. Chichester Avenue west at the southbound on-ramp to I-95 at Boothwyn. Photo taken 08/04/04. State named shield posted ahead of the parclo interchange joining Chichester Avenue with I-95 between Boothwyn and Linwood. Photo taken March 2000. Pennsylvania 452 stems north from U.S. 13 in Marcus Hook to cross paths with I-95 at a parclo interchange (Exit 2). State-named shields for I-95 here were replaced by 2004. Photo taken December 1999. East from Central Philadelphia, Race Street splits into a ramp for I-95 (Delaware Expressway) north, Front Street south to the I-95 southbound on-ramp at Market Street, and the eastbound continuation to Columbus Boulevard at Penns Landing. Photo taken 06/03/02. This button copy overhead for the Delaware Expressway was located along State Road south adjacent to Interstate 95 at Disston Street. Disston Street provided part of the connection from Pennsylvania 73 to I-95 south along with Keystone Avenue and the Princeton Avenue on-ramp. Photo taken 05/20/00.